Artificial intelligence – or AI – is a true part of our world, as well as a substantial hub of interest for science and business. Companies are ferociously investing in, engaging in and including artificial intelligence in their operations. It is a fascinating technology that enables new options for companies, from detecting security intrusions to anticipating future consumer purchases. Some significant moves from tech giants to acquire AI competitiveness have been made in the past five years. This includes the creation of Microsoft Ventures’ fund for AI startups and Uber’s acquisition of AI startup Geometric Intelligence; both in December 2016, Apple acquiring Emotient in early 2016, Google buying Deepmind for $400 million in 2014, and IBM pairing up with Nvidia to enable faster responses for the cognitive system, Watson. We reached out to some of the top influencers to ask them for their views on artificial intelligence. We spoke to Mike Quindazzi (#6), John Hagel (#12), Gary Marcus (#14), Jeremiah Owyang (#15) and Sandy Carter (#17). Be sure to follow them to stay up to date on the best content and resources on artificial intelligence! We were very interested in seeing which individuals, brands and publications were leading the social media debate around AI, so we analysed over five million tweets mentioning the key words: AI OR “artificial intelligence” OR artificialintelligence; from 1st January – 18th May 2017. We then identified the Top 100 most influential individuals, brands and publications leading the discussion . 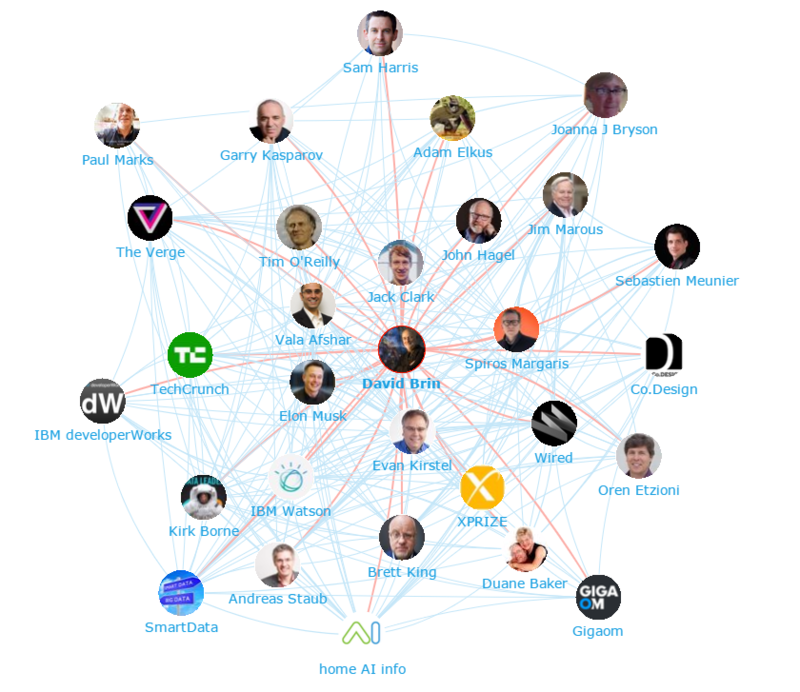 Regarding individuals, David Brin is the top AI influencer since the beginning of 2017. Below, is our network map of his recent interactions around the AI topic. This map was created with our Influencer Relationship Management software (IRM). Be sure to click on the map to enjoy the full size network diagram in greater detail. 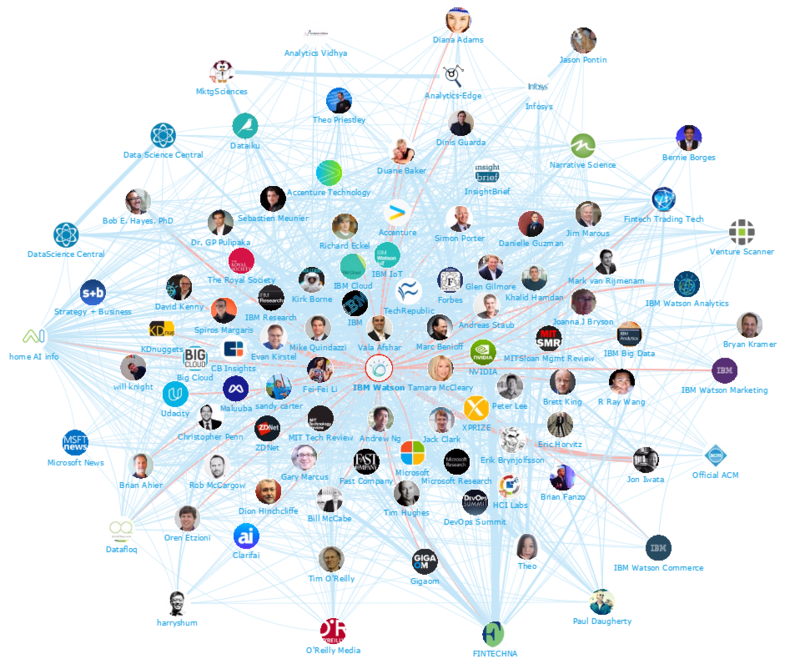 Below you can see another network map created with our Influencer Relationship Management software (IRM) showing the number one brand IBM Watson at the centre, as well as all the AI conversations to and from the influencers in its field. Below, you can discover yet another network map created with our Influencer Relationship Management software (IRM) with the number one publication WIRED at the centre of all interactions. Below, you can find a pie chart which assesses the different shares of voice of each brand within the AI social media debate – amongst the top influencers listed in the full report. We have displayed the top 10 brands, from 1st January – 18th May. This pie chart was created with our Influencer Relationship Management software (IRM). The most popular brand in this analysis is Google, which represents over a quarter (26%) of shares of voice. The most recent discussions around Google and AI focus on its speech recognition technology with a 4.9% word error rate and its AI abilities to create sounds that humans have never heard before. IBM follows with 21% of shares, with Watson at the centre of its AI discussion – especially around the system’s constant improvement and the possibilities it enables, whether they are intended for medical use or business. On the last step of the podium is Microsoft (13%). 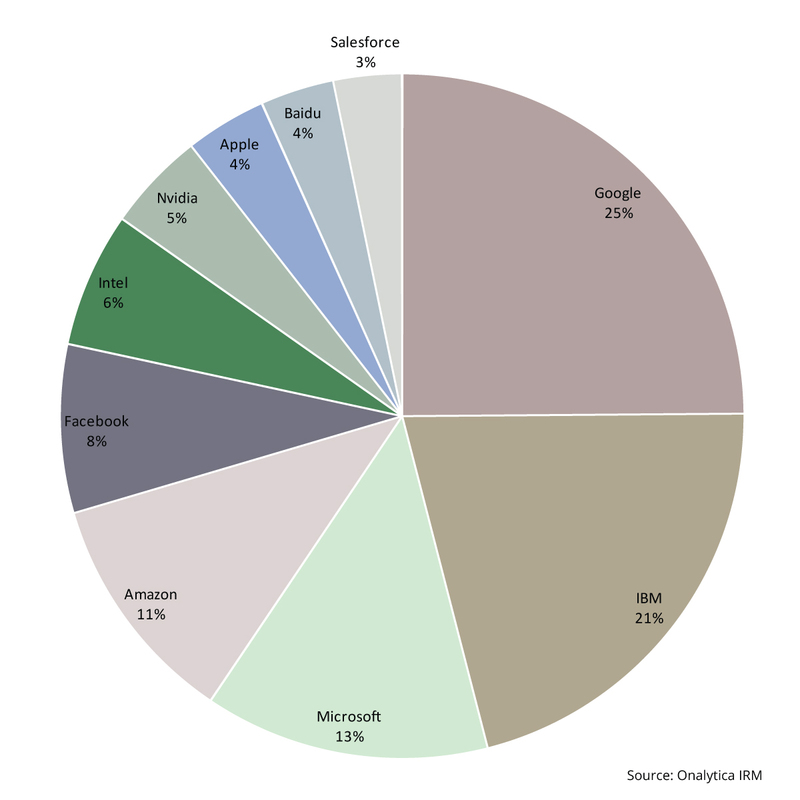 Following their lead are other tech giants: Amazon (11%), Facebook (8%) and Intel (6%). On the bottom of the top 10, we find Nvidia (5%), Apple (4%), Baidu (4%) and Salesforce (3%). It is interesting to see that Machine Learning, Deep Learning and – naturally – Artificial Intelligence accompany AI as the top topics. 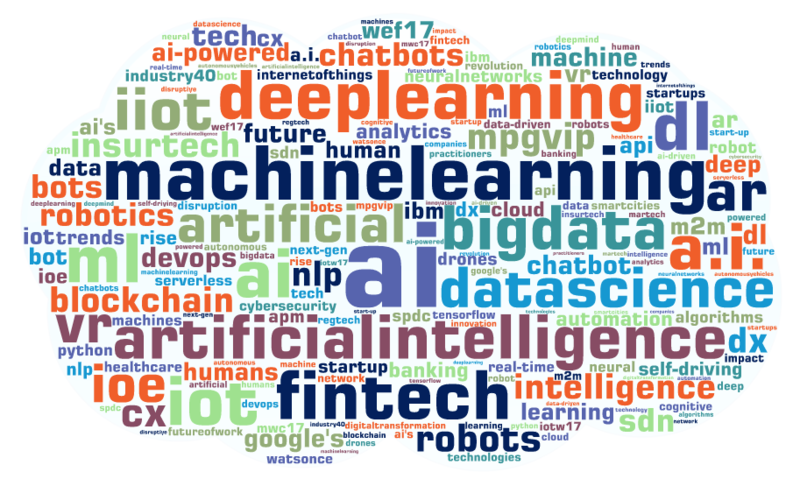 Also worth noticing, is the presence of Big Data, Data Science and FinTech as top AI-related topics. 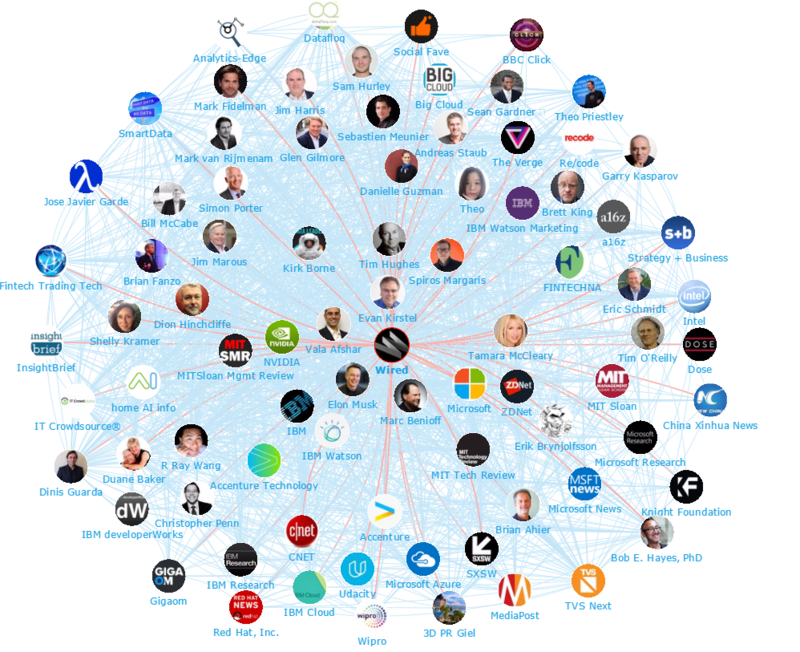 We looked at all the individuals engaging on Twitter to bring you a list of the top influencers around artificial intelligence. Below is the top 50, if you want to see who ranks from 50-100 be sure to download the full report by clicking the download button below. We also looked at all the brands engaging on Twitter to bring you a list of the top brands talking about artificial intelligence. Below is the top 50, if you want to see who ranks from 50-100 be sure to download the report to get the full top 100 list, and see who are most the influential brands in artificial intelligence. 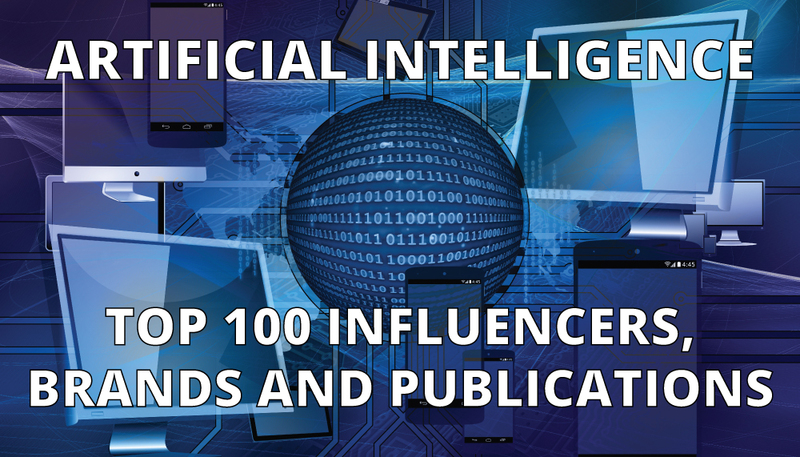 As part of our new analysis, we scanned all the publications engaging on Twitter to bring you a list of the top publications talking about artificial intelligence. Below is the top 50, if you want to see who ranks from 50-100 be sure to download the report to get the full top 100 list. Disclaimer: As ever with these lists, it must be stressed that the ranking is by no means a definitive measurement of influence, as there is no such thing. The individuals, brands and publications listed are undoubtedly influential when it comes to driving discussion around artificial intelligence.